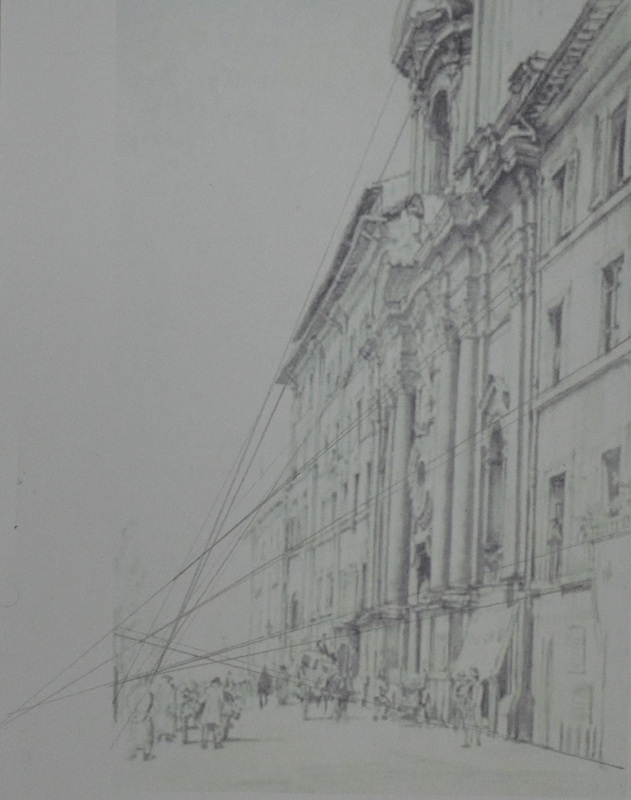 What problems did you find in executing perspective drawings? I thought I would fly through this project as I’ve always been quite good with perspective, having studied design and communication at school but I struggled with the Angular Perspective exercise and did quite a lot of line correction, mostly due to the irregular shape of the temple roof and getting that wrong threw everything out. Another problem I had was lining the wall up at the side and to the front of the temple which was like drawing another level at the same perspective. My biggest problem is trying to get everything perfect rather than trying to keep the right perspective while simplifying the drawings. Make notes on the merits of using, or not using, rulers to guide you. I think that using a ruler for me would have to be the final solution for a smaller drawing but maybe a necessity for larger drawings. For smaller drawings taking your pencil from A to B without wobbling all over the place isn’t that difficult and once you have the basic shape of the subject it can be developed with some correction and modeled to almost perfection. I feel that using rulers on the other hand for anything other than technical or larger drawings, for me especially, may lead to overworking the drawing and even more correction trying to find the right angles, right lengths etc. For this exercise I decided to use the temple next to my school, that my school gets its name from ‘Wat Makut’, Wat meaning temple. Temple’ grounds usually contain several buildings including monks quarters…dorms or whatever you would like to call them, the cremation furnace, schools for teaching student monks and a host of other buildings. After a walk around the temple I decided to draw what I think is a school room as it had a blackboard outside. 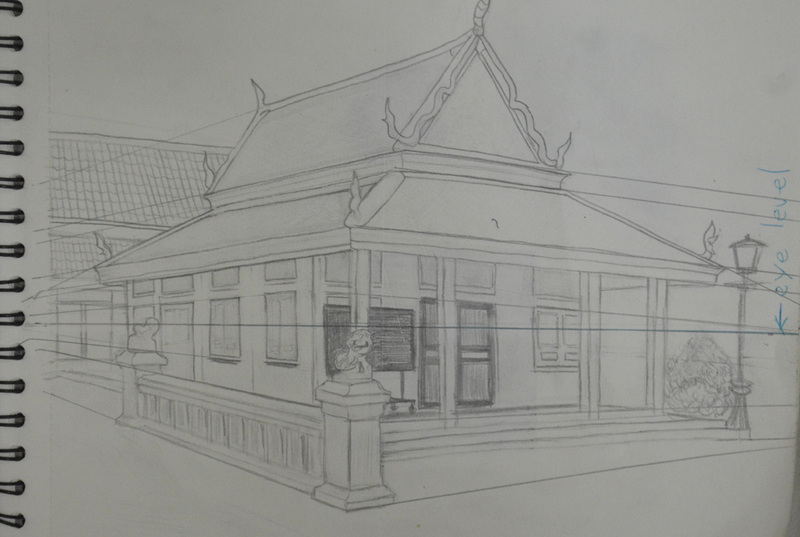 The best thing about Thai buildings is that they are mostly right angles and so it’s quite easy to get the angles and perspective correct when drawing however the downfall is that Thai temples are really quite technical structures and there was a lot more right angles than I was hoping for. I started out by drawing the roof and the windows and although I knew this was supposed to be an exercise using only line it did help to block in the windows and doors with solid shapes especially on the irregular shaped roof I also drew the wall at the side in the same way buy blocking in the square shapes in the wall and then erasing the solid shapes and going over the outlines again with just line. Although the drawing may look like I have used a ruler it was done completely freehand and it was by no means easy erasing and correcting every line in the drawing at least three times, and now and again erasing large sections of the drawing to start again. Getting things ‘just right’ seems to be my biggest weakness, it would have been a lot easier to do a tonal drawing of the building and I’m looking forward to doing so at some stage. I marked on the drawing where I think the eye level is but I was sat on a chair outside the main temple building to draw it and I couldn’t really walk over and maintain the same level to check if I was correct. I thought I would have been able to do this at home but unfortunately the drawing fit too well on the paper and I couldn’t even check the vanishing points properly as the rings holding the paper wouldn’t let the ruler sit flat in order to draw the lines through to the other sheet of paper. 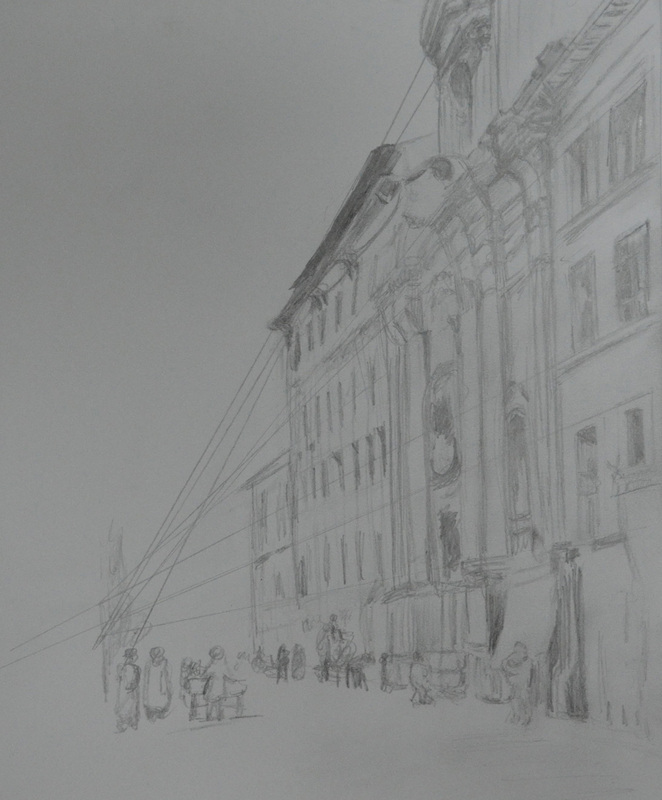 However from continuing the lines to where I think the eye level is it seems that the front of the building maybe slightly out which I can live with as I think I did quite well on this exercise. The drawing too me nearly three hours over two days and although the temperature here in Bangkok had dropped considerably over the last week the sun was still scorching hot. I’m not sure whether I did the second part of this exercise correctly but with the very positive results of the second part of this exercise I chose not to change it and to leave it how it was. 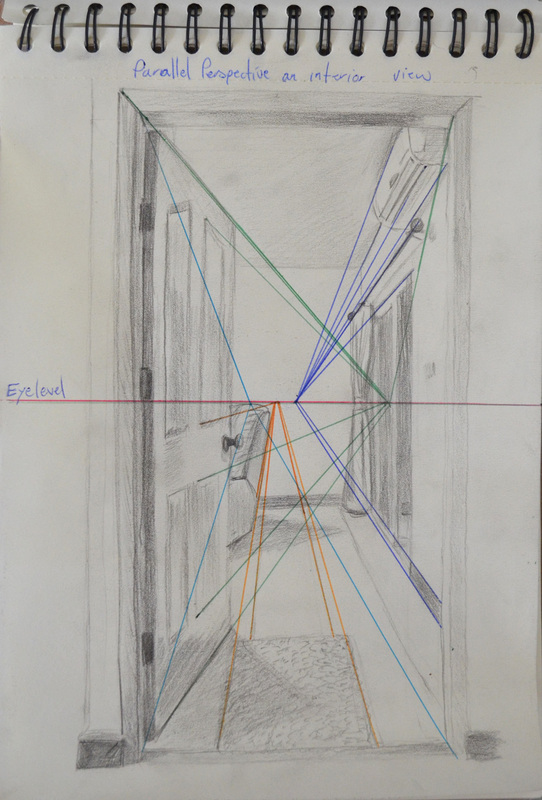 Firstly the brief of this exercise was to draw an interior view through a door a doorway inside a building I chose to draw to draw the view in my apartment from the bedroom into the living room. I placed a rug in front of the doorway as instructed but thinking about it now I think I got the ‘wrong front’ with the rug in front of the doorway facing the other way. I drew in line as well as tone, the main reason for this being that I found it quite difficult drawing straight lines without a ruler and using tone helped me to get the space right between the lines. 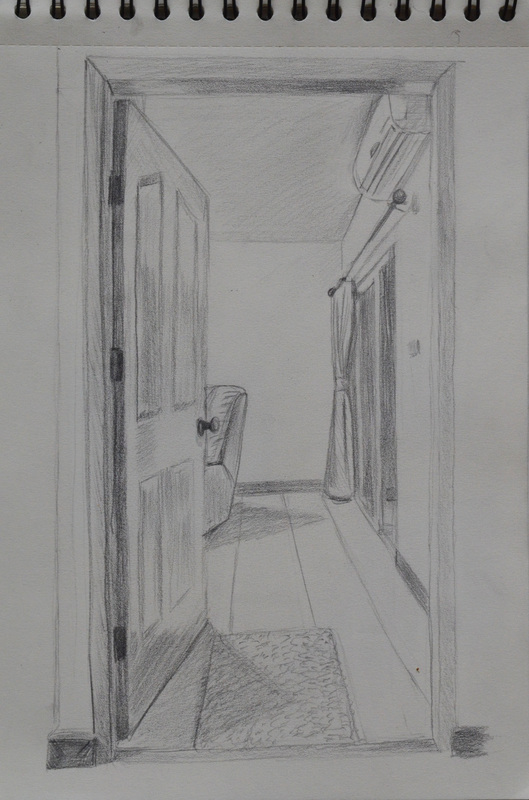 I didn’t do much erasing and correcting lines as I was quite happy with the first attempt apart from the rug which seemed a bit wide. I realised afterwards that the reason why the rug seemed wide is because I made the door-frame wider than what it actually is and the negative space took the rug wider. This also meant that everything on the right and left of the door-frame was further apart but I didn’t think erasing and restarting was that much of an emergency so carried on. I live in a small 1 bedroom apartment in Bangkok with all the doors in irregular positions so the only real view I could draw was from the Bedroom into the Living room with the patio door into the kitchen on the right hand side, I didn’t think it would give me as many lines as it did but with the air-conditioning the open door and the patio door it gave me a great perspective. When it came to the second part of this exercise the brief kind of confused me so the way I did things next probably conflicted with the brief in the coursework. I had a pack of gel-ball point pens in different colours. I used one colour to draw in the eye-level and then different colours for the groups of lines that met at different vanishing points. I was very surprised by how accurate the angle of my lines were in the drawing I was also very surprised to to see which lines in the drawing met at the various vanishing points across the eye level line.